On January 31, 2016 the 31st Annual 99.9 KISS Country Chili Cook off. 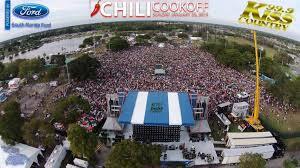 This wonderful chili inspired event will take place at C.B Smith Park in Pembroke Pines. This chili cook off has been happening for over three decades now. The top notch country music at the event especially this year is an awesome line up.This year the headliner is Little Big Town, and the lineup also includes Jake Owen, Chris Young, Dan + Shay, and Maddie & Tae. Ticket information can be found at WKIS.com. Concert gates open at 8:30 a.m., and the concert begins at approximately 10 a.m. Other ticket outlets include Grifs Western, Pet Supermarkets in Broward and Miami-Dade, and select locations of Sedano's Supermarket. This is a rain-or-shine event, meaning no refunds will be available. Also, no cans, coolers, bottles, video cameras, flags/flagpoles, weapons, umbrellas, backpacks, or pets allowed. Food and refreshments will be available for purchase. Chili from the competition cannot be tasted by the public unless the contestant has a registered food vendor permit. The Chili Cook off will have you walking around tasting chili made by great folks from all over the country and are vying for your vote. After you have tasted all the chili you then vote and place your ballot for your favorite chili chef. Forgotten Soldiers Outreach is once again the benefactor of the Chili Cook-Off. FSO is a non-profit organization that ships care packages filled with donated items and letters of encouragement to the United States military men and women actively serving overseas. FSO has been sending these monthly “We Care” packages to deployed troops since 2003. Now in their 13th year, FSO has benefited close to 400,000 of our United States Armed Forces deployed overseas, all over the world and in all branches of the military.